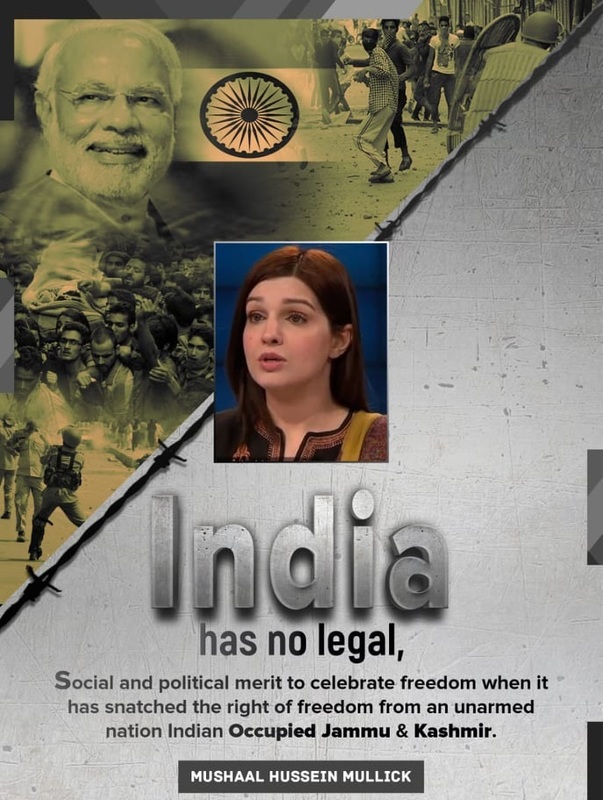 ISLAMABAD:January 26,2019- Mushaal Hussein Mullick,Chairperson Peace and Culture Organisation and wife of Jammu Kashmir Liberation Front (JKLF) Chairman Yasin Malik, vowed that the observance of Indian Republic Day, as ‘Black Day’ by the people living on both sides of the line of control is the testimony that people of the occupied valley could not be deprived of their internationally-acknowledged right to self-determination for long. Mushaal in her statement on Saturday said that the people of Azad Jammu and Kashmir (AJK) and Indian Occupied Kashmir (IOK) observed black day to give a clear message to the world community to take notice of the continued long illegal and forcible Indian occupation of the IOK. She said that India has no legal, social and political merit to observe Republic Day when it has snatched the right of self-determination from Kashmiri people by using brutal force. She said that India government could fool its masses by observing Republic Day but cannot blind the Kashmiri people and world community, as it is a well known fact across the globe for severe human rights violations in Indian occupied Jammu and Kashmir. Lashing out at the Indian government, she said that Kashmiri people are not only being deprived of their right to self-determination, but they have been denying their basic human rights for over the last seven-decade. Mushaal said that the puppet government always resorted to harsh tactics such as jailing and torturing the senior Kashmiri leadership and the brave people as well as restricting the Internet facility in order suppress the voices of Kashmiris. However, she vowed that such tactics would not work and India has to answer the unabated genocide of Kashmiri people committed by occupied forces for the last seventy years. She lamented that the terrorism of these forces are now targeting innocent Kashmiris through pallet guns, resultantly over 8424 youth and children have been injured in last two years of which many youth have even lost their eye sights; however the international community is yet to take action against the brutality. Mushaal further said that the world community’s continued inaction and silence over the unabated Indian forces human rights violation and genocide proved counter-productive as it encouraged the Indian government to commit more human violations. She expressed her disappointment over the world leaders’ failure to implement the recommendation of the UN report on human rights violation in the IOK and adds that she does not understand as to why the world leaders are silent over the continued brutalities and custodial killing of the innocent Kashmiris.